Here are the results of the Scavenger Hunt. How many did you know? Who said “If you are looking for support to organize an event, I strongly encourage you to consider Jacqueline.” Yes, I do event planning. Read what one client, Friends of Marviva Foundation had to say. Who are The Shrinking Violet and The Brine Hound and where can they be found? These are two of the Oyster Lover profiles described by Rowan Jacobsen, author of The Geography of Oysters. An autographed copy goes to each of the first ten OCC© members to join. There are ten photos on my Photography page. Which photo by your always hungry friend has been published? The hint here was "always hungry" and of the photos on my photography page, the first one was published in the iWine Report on Navarra Rosé. I’m the “go-to-gal for questions about sustainability, seafood and social media” for what conference-planning, app-developing powerhouse? Clues here were social media, conference: I spoke at Babette Pepaj's TechMunch conference. What is the ironic connection between two of my favorite writing clips? Amongst my clips are a piece for Culture: the Word on Cheese and the Washington Post (on dining out with food allergies). I'm now allergic to dairy which means no more of my beloved cheese. Name one chef that I introduce on a video. Gabe Bremer - Salts; and Peter Davis of Henrietta's Table are two chefs that I introduce and talk to on the Media Clips, here. Name the workshop that Christopher Myers & Joanne Chang said this about? “...we were energized to learn more and to help realize a better future for not only the diners of tomorrow but their children, as well.” The workshops I give to restaurants/chefs on sourcing and using sustainable seafood are called "Teach a Chef to Fish" and I've been doing these trainings for a couple years. They are an outgrowth of the Teach a Man to Fish sustainable seafood event I do here, in a virtual potluck/teach-in format. What’s my favorite hashtag right now? 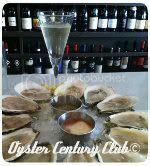 #Oyster100 follow that hashtag on Twitter to see what fellow members are Tweeting, what oysters they're eating and where they're enjoying them. Name one new thing you learned about me from this site/contest. I hope this little contest helped you learn more about my new site and something about me and my work as well. Please feel free to share this post and help me spread the word. I love and appreciate your referrals! AND THE WINNER IS: Congratulations to Jenni Fields for getting 8 out of 10 answers right. Let me know which sponsor you choose and I'll send a $25 gift certificate your way.